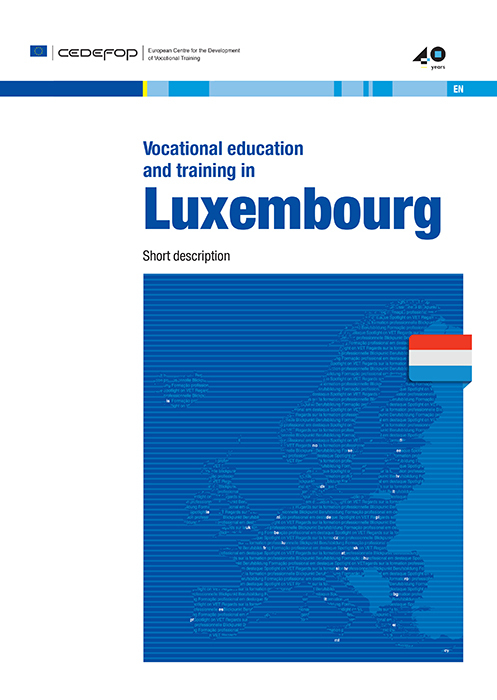 Cedefop has built on the ReferNet country report structure to produce the short description of vocational education and training in Luxembourg for its Presidency in the EU in 2015 providing an insight into its main features and by highlighting VET policy developments and current challenges. Luxembourg’s vocational education and training (VET) is highly differentiated. Apprenticeships and school-based VET coexist. While some features may seem similar to those in other countries, taking a closer look is important to understand national concepts and terms. Luxembourg’s education and training system reflects its geographic and socioeconomic context: its small size, the close ties with its neighbours, its multilingual nature and high share of foreign nationals, and the well-established cooperation with social partners. Recently implemented reform has strengthened the links to the labour market and brought about a shift towards competence-based and modular vocational programmes. The implementation of this reform has also revealed weaknesses in the system; evaluation of the reform will provide stakeholders with evidence of a need for further changes.